From automata and masks, to print and photography, the Big Picture Llanelly House final exhibition brought together a selection of artwork made over the last 18 months by 120 participants from nine local schools, Coleshill Day Centre and Hafan y Coed Care Home. The exhibition was ceremonially opened by the Chair of trustees, Cambrian Heritage Regeneration Trust, who introduced the project before inviting lead artist Pip Lewis, from spacetocreate to share a few words about the creative journey participants had made over the last 18 months. Gareth Morgans, Head of Education services for Carmarthenshire County Council, spoke about the quality and diversity of the work as well as the importance of art and creativity in the curriculum, prior to everyone involved being presented with a medal and certificate by the Mayor of Llanelli and other local dignitaries. More than two hundred people attended the opening, including the participants, their teachers, parents, grandparents, guardians and the artists who had been involved in leading the workshops. The exhibition runs from 8 – 18 June 2016 during normal library opening hours. If you can’t make it along you can view the exhibition booklet by clicking on the link. This entry was posted in Uncategorized and tagged Exhibition on June 9, 2016 by guynorman. The Exhibition Opening of Pattern Portraits, made by pupils from Bigyn Primary School took place this afternoon at Llanelly House. The exhibition was opened by the Mayor Councillor W.G. Thomas. Parents and staff from the school came to see the work which will be on display for the next 3 weeks in Llanelly House. After that it will be joining the grand Exhibition of all the 12 projects that have taken part in the Big Picture project, in the Library opposite Llanelly House with the Opening on Tuesday June 7 at 11.30 am – All Welcome! This entry was posted in Bigyn Primary School and tagged Bigyn Primary School on May 17, 2016 by guynorman. 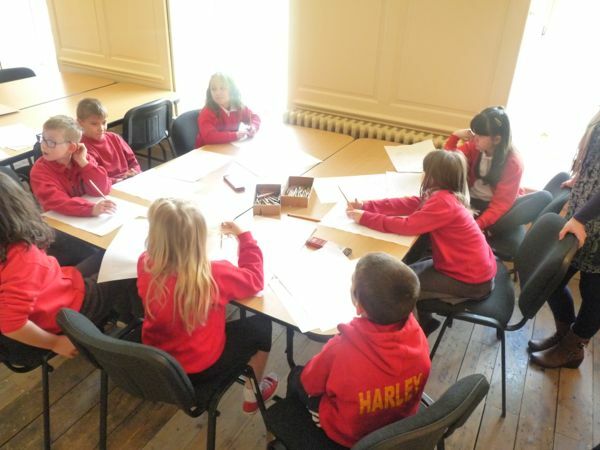 In the third and final session at Llanelli House, we continued to work on our final peices. To begin, Pip asked us to take it in turns to draw lines on the interactive whiteboard. We did this in order to get a better understanding of the kind of lines we could use for details on our portraits. We spent the rest of the morning finishing off our portraits. We used some of the lines we had drawn earlier to try and define and pull out facial features such as eyes, lips and ears. Some of us chose to work on the backgrounds as well as the face. What is really interesting is the wide variety of different lines, patterns and colour we have all used! Finally Hal took photos of us all holding our finished portraits. We are looking forward to seeing them mounted in the exhibition next week! This entry was posted in Bigyn Primary School and tagged Bigyn Primary School, Pattern, Portraits, Self portraiture on May 16, 2016 by guynorman. In our second session at Lanelly House, we began to work on our final pieces. These were inspired by a wonderful project led by Julie Ann Sheridan an Artist who worked with the Young Artists Club at Oriel Myrddin in Carmarthen. To begin, Tia read out the fist blog post to allow us to recap on last weeks session. While she was doing this, Hal took portrait photos of Amber and Elwood as they were not with us for the first session. We then spent around half an hour finishing off our pattern sheets, trying to fill them up with as many different shapes and patterns as we could. Once the pattern sheets were completed, Pip gave us tracing paper and asked us to stick it down over the top of the portait photos we had taken in the previous session. We then had the complicated task of drawing a grid onto the tracing paper. This took alot of concentration as each line had to be measured out to ensure the grid would be of an equal size. Once the grid was completed, we started to work on our portraits using the pattern sheet as guidance. Using felt pens, we drew a different pattern on each of the squares. At first, some of us found this difficult to understand, but by the end of the session everyone had made a good start on their work, creating some wonderful results! To finish, we played a game which involved splitting into two groups, and taking it in turns to run down the room and write as many words as we could to describe how we felt about today’s session at Lanelly House. 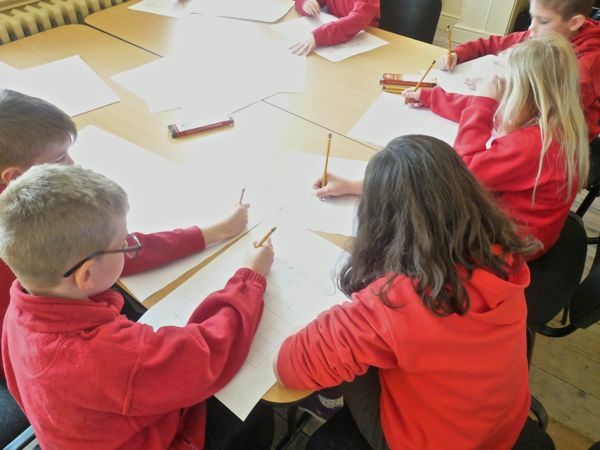 This entry was posted in Bigyn Primary School and tagged Bigyn Primary School, Grids, Julie Ann Sheridan, Oriel Myrddin, Pattern, Portraits, Tracing on May 9, 2016 by guynorman. Stories of our Lives is a digital portrait photography project offering a window into the lives of six people living at Hafan Y Coed Care Home Llanelli. The exhibition runs at Llanelly House from 26 April through to 16 May 2016. This entry was posted in Hafan-Y-Coed and tagged Hafan-Y-Coed, Life Stories, Stories of our lives, Studio Portraits on April 26, 2016 by guynorman. 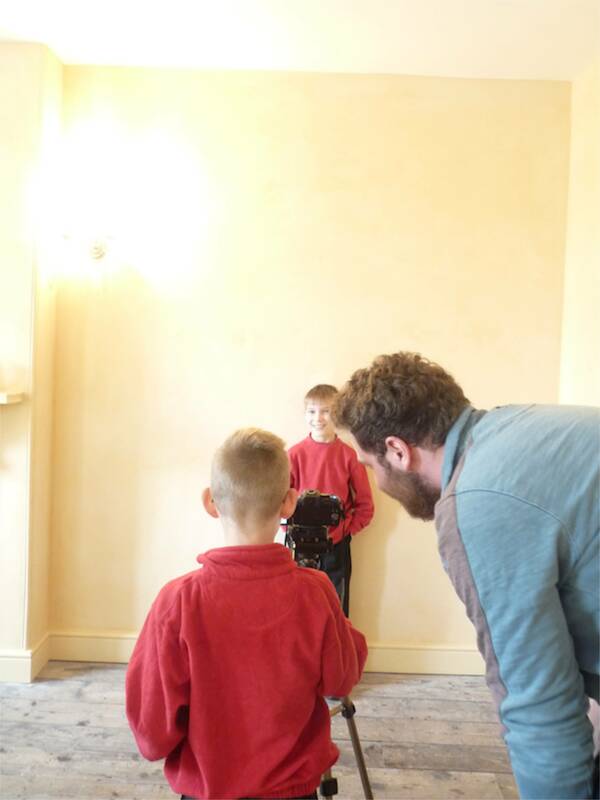 On Tuesday 19th of April eight year three/four students from Bigyn Primary School had their first Big Picture workshop exploring patterns, place and ourselves, with Artist Pip Lewis and Project Assistant Hal Lewis-Norman. As a session warm up, we were each given paper and were asked to draw a pattern of any kind. We then passed the drawing to the next person who then drew another pattern. This continued until the pages were full of patterns and lines. Taking it in turns we then shared our artwork with everyone, discussing the many different types of patterns possible to draw. 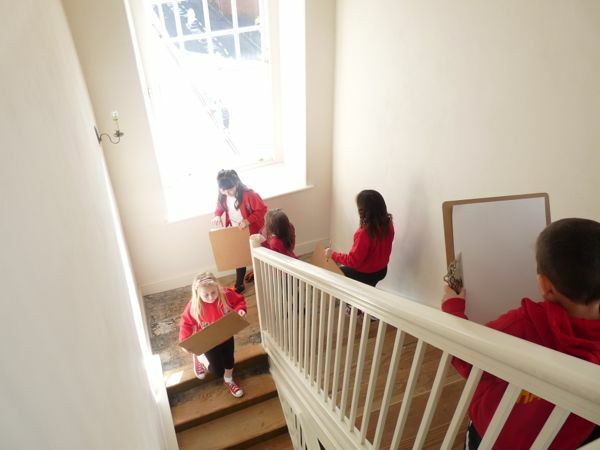 We then spent some time exploring Llanelly House with clipboards, trying to capture as many patterns and lines as we could find. We began in one of the drawing rooms, filled with fine carpets, games boards and grand fire places. We then had a look in one of the master bedrooms, with its large windows, 4 poster bed and artwork! Finally we headed up a tight staircase up towards the servants quarters. Here the light levels were much lower, and it was harder to pick out the patterns and lines we were looking for. After the break we did a face proportions drawing exercise. This started by drawing the head, making sure that it was an oval shape, not circular. 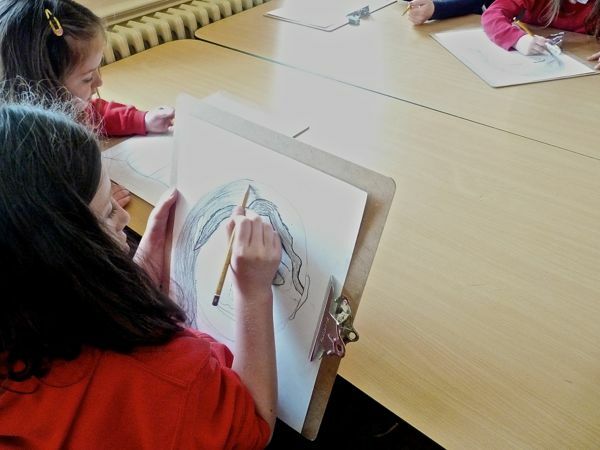 We then moved onto drawing the eyes, taking extra care to ensure they were centred. Pip showed us a technique which involved drawing five eyes across the middle of the face then rubbing the middle and outside ones away. After this we moved onto the nose, mouth, eyebrows and finished with the hair. Some of us added extra features such as our own hairstyles to make the drawings unique to us! Finally we worked with Hal to take portrait photos in preparation for the next weeks workshop. Working in pairs, we took it in turns to use the camera to take a photo of each other. Here are the finished drawings from the face proportions exercise. This entry was posted in Bigyn Primary School and tagged Bigyn Primary School, Pattern on April 24, 2016 by guynorman. A selection of work from the A Place of my Own project with pupils from Bynea County Primary School is now showing at Llanelly House, until May. Lead artist Pip Lewis, project Facilitator Cheryl Kitt, and Project Assistant Tangwen Roberts joined pupils, staff, parents and the Mayor’s representative to celebrate the opening of the exhibition on Tuesday 12 April 2016. This entry was posted in Bynea County Primary School and tagged Bynea County Primary, Exhibition, Llanelly House on April 18, 2016 by tangwenroberts.